The sale of the powerful S-400 surface-to-air missile systems to China not only marks another milestone in Russia-China relations, it is a remarkable example of how a comparatively inexpensive weapon can make a trillion dollar project obsolescent before it even gets off the ground. It’s not often that a relatively inexpensive air defence weapon is able to make a trillion dollar fighter programme obsolete. But the $500 million S-400 missile system has done precisely that to America’s brand new F-35 stealth fighter. In November 2014 Moscow and Beijing inked a $3 billion agreement for the supply of six battalions of S-400 anti-aircraft/anti-missile systems that will significantly boost China’s air defence capability against the US and its allies in the Western Pacific. With a tracking range of 600 km and the ability to hit targets 400 km away at a blistering speed of 17,000 km an hour – faster than any existing aircraft–the S-400 is a truly scary weapon if you are facing its business end.First deployed by Russia in 2010, each S-400 battalion has eight launchers, a control centre, radar and 16 missiles available as reloads. But first a bit of background. 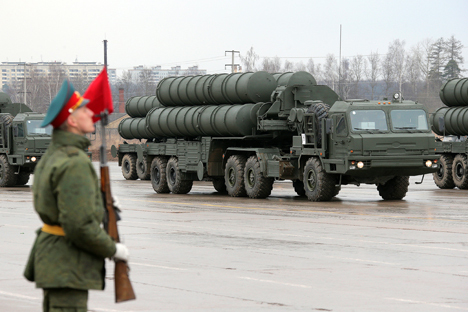 The S-400 was developed to defend Russian air space and a few hundred kilometers further against missiles and aircraft of all types, including stealth. Because it is a highly potent and accurate weapon that can tip the balance of power in any war theatre, Moscow has long resisted the temptation of exporting even its older iteration, the S-300, to troubled allies Syria and Iran. However, China’s case is different because the chances of another country daring to take a shot at the Chinese are next to zero. This development is really bad news for the F-35. Russia and the US have traditionally adopted different military strategies. During the Cold War the US relied upon carrier-based aircraft to project power in the Western Pacific, and the strategy continues today. The Russians on the other hand decided these floating airfields were easy targets for their shore-based long-range aviation and anti-ship cruise missiles. The Russians were so sure about the accuracy of their cruise missiles that the Backfirescarried only one Raduga Kh-22 (NATO name AS-4 Kitchen) missile armed with a nuclear warhead. According to weapons expert Bill Sweetman and Bill Gunston these missiles could be “programmed to enter the correct Pentagon window”. China too is following the same trajectory. It has adopted the Russian Cold War strategy of attacking aircraft carriers with waves of bombers armed with its cruise missiles(that are knockoffs of Russian missiles). In fact, complete destruction of a carrier isn't necessary; even slight damage can put such large vessels out of commission for months. And since wars don’t last that long these days, the crippling of its carrier arm will force American capitulation early on in any conventional conflict. To counter the missile threat to its carriers, the Americans are relying on the F-35 as a cruise missile killer. More than a trillion dollars have already been spent on this troubled project. Even if the F-35 is able to miraculously overcome its shortcomings, the S-400 upends this strategy. Lockheed-Martin claims the F-35 has such advanced electronics that it can jam anything directed at it.But the S-400 won’t be easy to shake off. “It has many features specifically designed to overcome countermeasures and stealth, such as a larger, more powerful radar that is more resistant to jamming. It also actually has a set of three missiles of varying range that provide overlapping layers of defense," Ivan Oelrich, an independent defence analyst told The Diplomat. There’s another way the S-400 degrades the F-35’s availability. Fourth generation aircraft such as the Su-30 and MiG-29 have aluminium bodies but stealth aircraft have composite bodies with special radar absorbing coating that requires several hours to apply. For each hour of flight, the F-35 requires 9-12 man hours of maintenance. But that’s in normal flight. Wear and tear will be of a higher degree during evasive maneuvers that are inevitable if trying to shake off an S-400 radar lock (that's if the F-35 has enough time to react to the missile in the first place). Not only does the stealthy skin require new repair techniques, but extensive skin damage will necessitate repairs at Lockheed's land-based facilities. It is because of this reason that Eglin air force base in Florida has 17 mechanics per F-35. The F-35’s backers say the aircraft can emit frequencies, which can confuse and disable the S-400. But the US Navy's acquisition of 22 Growler jamming aircraft suggests the F-35’s jamming capability is not really all that it’s cracked up to be. According to Air Force Technology, there aresome figures in the US Navy and industry which say the F-35's stealth and EW capabilities are simply not enough. These weapons the Pentagon is losing sleep over are clearly the S-300 and S-400. The missile deal is a pointer to the increasing bonhomie between the political leaderships in Moscow and Beijing. The S-400 deal follows the clearance of the Su-35 fighter-bomber sale to China last year. Negotiations that had got bogged down for years because the Russian side wanted to protect their intellectual property were greenlighted after the West imposed sanctions. The Russian concern was the Chinese would buy a few ‘samples’, take them apart, and then cancel the deal after deciding they could reverse engineer local versions. These knock-offs which would then be peddled cheap as chips overseas. In fact, the Chinese have traditionally reverse-engineered Russian weapons. Their J-15 jet fighter, for instance, is a copy of the Russian Sukhoi-33. However, the complexity of the S-300 and Russian aircraft engines has proved to be the biggest constraint on Beijing’s copycat industry. This has reassured Moscow about proceeding with the sale of advanced weaponry. Plus, in 2008 and 2012 Russia made China sign stronger intellectual property protection agreements. As of now Beijing will only receive four of these systems, but even this small number will be enough to create the daddy of Iron Domes over future battlefield theatres. If you are an F-35 pilot, here’s a piece of advice: stay out of range.